Semi-insulating hinged door, used for technical areas, offices and toilettes. • divide hygienic areas (toilettes, showers) from the dressing room. • Up to 1500 x 2500mm. • The two blades can have different widths, often the semi-fixed part is requested more little of the mobile one. AMP is a leading manufacturer of Industrial Refrigeration Doors and fast-fit cold rooms located in the outskirts of Athens, in Greece. Having 50 years of experience in the construction of all cold room types, sizes and specifications, panels and refrigeration room shelves. AMP is an innovative and reliable manufacturing company which cooperates with well known industrial suppliers that specialize in the construction of thermo-insulating doors suitable for food, pharmaceutical and health industries, for distribution industries, retail and catering use. They have a superior lifetime, thermal and air-tightness systems that deliver energy saving. Our reputation, longevity and success is centered around our ability to produce with 100% precision, resistance and robust methods of construction, a superior product design at very good prices, keeping our customers extremely satisfied. Our Off-site manufacturing methods facilitate rapid, safer and high quality on-site assembly allowing earlier project completion and income stream. 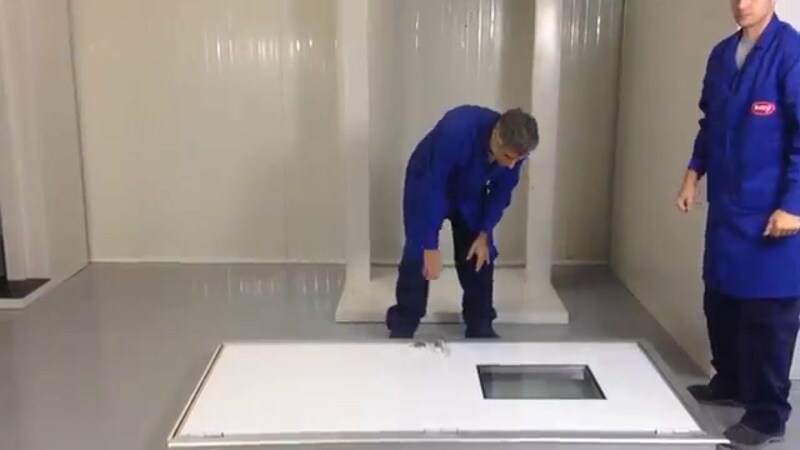 Our production process is fully computerized and our skilled engineers can design and produce any specification of cold room doors, according to customer requirements. Capitalized on German knowledge with the use of our long term experience, our products meet the top of the European technology, combining reliability, energy saving, and high product resistance. Our AMP ECO-safe industrial doors for cold rooms (insulated) are the result of extensive research and development work to provide an optimized and sustainable solution for our customers. AMP cold room industrial doors have a low GWP (Global Warming Potential). Our doors are manufactured and finished to the highest quality standards in order to achieve maximum durability. The door design features a high density CFC free polyurethane core that is coated in an extensive range of colors. We also offer product life warranty. We work all these years with reputable business partners, with very positive results and we offer high quality industrial products, based on our customers needs at affordable prices.